By building a new agency, DCYF is preparing to integrate and align early learning, child welfare, and juvenile rehabilitation services in Washington. Before we can effectively improve programs and services for children, youth and families, we need to first set goals by which we can measure our effectiveness. The legislation that created DCYF, House Bill 1661, declares a vision that children in Washington state “grow up safe, and healthy – thriving physically, emotionally, and academically”. In order to provide services in a way that accomplishes this vision, the new agency must measure the outcomes of each generation, paying particular attention to unequal outcomes for low-income children and families, communities of color, and other often marginalized groups. As we consider what outcomes we will set as goals for the new agency, we continue to ask ourselves two critical questions: how will we know that children, youth, and families are thriving, and what will need to be true to ensure this? To begin answering these questions, we first outlined three broad categories of outcomes: education, health, and resilience. These three categories were identified from our authorizing legislation as well as our belief that, taken together, measures in these categories will tell us the extent to which children across the state are thriving. 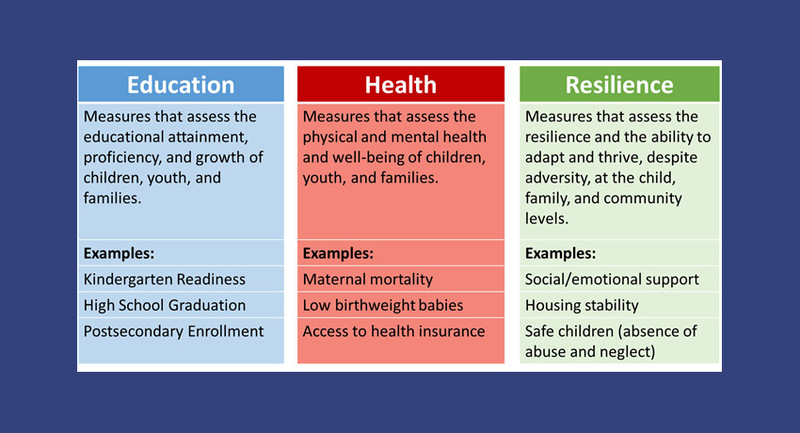 We know that outcomes related to education, health, and resilience will play a role in whether or not children are safe, healthy, and thriving, but how exactly will we measure those outcomes? Secretary Hunter often talks about DCYF being a “data-driven” agency, but there are some important considerations when using data to measure outcomes like those exampled above. First, it’s critical to be able to break the data down by different populations. House Bill 1661 itself requires DCYF to track outcomes by family income, race, and ethnicity. It is also important to build an understanding of potential bias in the data in order to appropriately account for it. We know that data are often not perfect, but we also know that measuring outcomes and setting goals is a critical step in creating, organizing, and delivering services in a way that actually helps children thrive. Right now, we’re in the process of building our full list of child, youth, and family outcomes that will drive all of our work, and the work of our system partners, in the coming years. Ideas for this list have come to us from staff, other agencies, consultants, and research institutions. However, our new agency will be placing at the center of its work the lived experiences of our clients and the providers who serve them. Creating this building block of our new framework depends on the input and collaboration of the whole system. So, whether you are a parent, caregiver, state agency employee, service provider, or a Washingtonian who cares about the future of our children, we know you have important insight into what these overarching outcome goals might be. If you want to weigh in on this process, please take a few minutes to fill out this brief survey. You can also always reach us at oiaa@dcyf.wa.gov with ideas or questions. In the coming months we’ll report out on the feedback we receive in this process, and on the list of outcome goals we choose.